I’m reading Arnold Schwarzenneger’s “The New Encyclopedia of Bodybuilding“. In addition being packed to the brim with great reading on the history of the sport, exercise plans, nutritional insights, etc. it has some great insight into the mental process that goes into getting in shape, and even preparing for a show. He wrote something that I haven’t been able to let go of… something that has much broader application than just the exercise arena. Oh man is that ever true!!! The biggest wins, the highest highs, the best memories, and the most lasting lessons typically follow that moment of fear that takes your breath away… but then you jump anyhow! 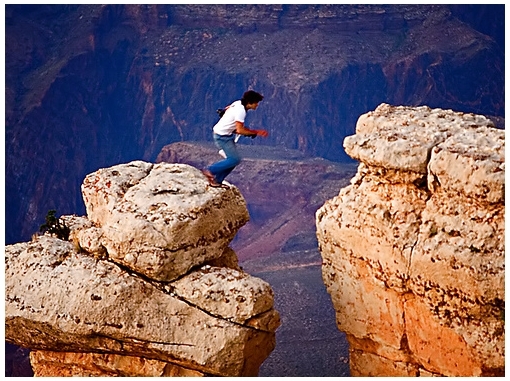 So why not look your fear in the eye… and jump! Go for it! The reward that lies on the other side of fear is amazing! < Previous People will make fun… who cares?